Methylation of DNA at cytosine residues in mammalian cells is a heritable, epigenetic modification that is critical for proper regulation of gene expression, genomic imprinting, and development. Three families of mammalian DNA methyltransferases have been identified: DNMT1, DNMT2, and DNMT3. DNMT1 is constitutively expressed in proliferating cells and functions as a maintenance methyltransferase, transferring proper methylation patterns to newly synthesized DNA during replication. DNMT3A and DNMT3B are strongly expressed in embryonic stem cells with reduced expression in adult somatic tissues. DNMT3A and DNMT3B function as de novo methyltransferases that methylate previously unmethylated regions of DNA. DNMT2 is expressed at low levels in adult somatic tissues and its inactivation affects neither de novo nor maintenance DNA methylation. 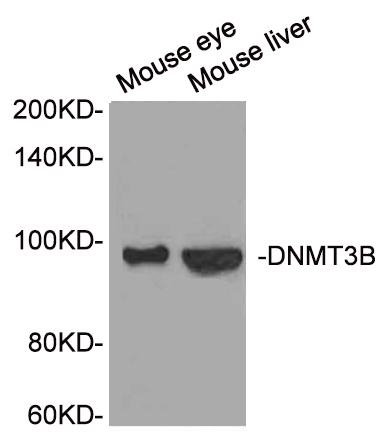 DNMT3L is a catalytically inactive regulatory factor for the DNMT3A and DNMT3B de novo methyltransferases that is expressed at low levels in embryonic stem cells, testis, ovaries, and thymus. These de novo methyltransferases consist of a heterotetrameric complex containing two molecules of DNMT3L, and either two molecules of DNMT3A or DNMT3B. DNMT3L contains an amino-terminal ATRX-DNMT3-DNMT3L (ADD) domain and a carboxy-terminal methyltransferase-like domain. The methyltransferase-like domain binds to DNMT3A and DNMT3B to stimulate catalytic activity by increasing the binding of S-adenosylmethionine and DNA. The ADD domain recruits the methyltransferase complex to transcriptionally inactive regions of the genome by binding to unmethylated histone H3 Lys4. 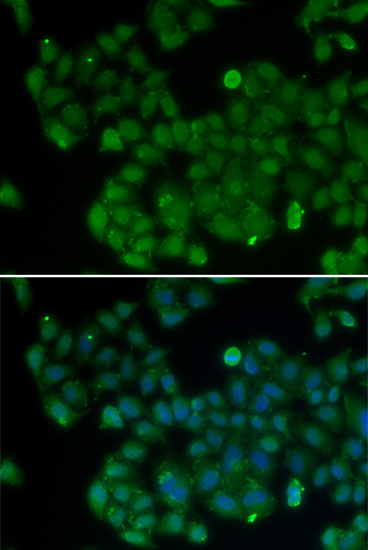 DNMT3L Polyclonal Antibody. Unconjugated. Raised in: Rabbit.